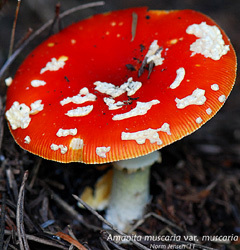 The common (in our area) Fly agaric, Amanita muscaria. You don't want to eat it raw, but see this entry on Mykoweb, which says it has been consumed, after proper cooking, by some people. This is Pink honeysuckle, Lonicera hispidula. 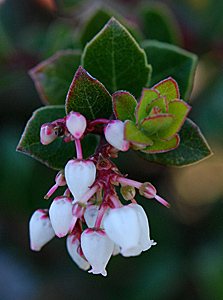 Hearn Gulch had a lot going on today, including this Bearberry manzanita or Kinnikinnick (Arctostaphylos uva-ursi). 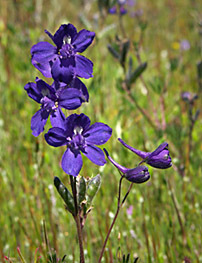 Other plants in bloom were Wight's paintbrush, California goldenrod, and Sticky monkeyflower. 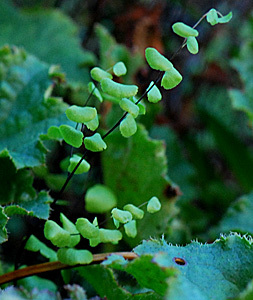 Near the bottom of the trail to the little beach, on the bank above eye level to the left, was this California maidenhair fern (Adiantum jordanii). I saw just the one instance of it, though I looked around for more. It was also not on the Hearn Gulch plant list, but has been added now. 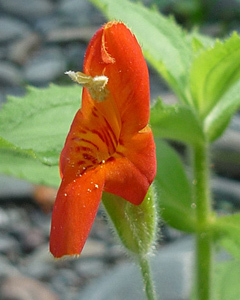 Scarlet monkeyflower (Mimulus cardinalis). Photograph by Bob Rutemoller. 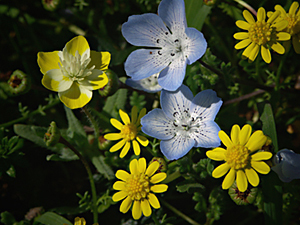 Found in damp or wet places, along streams and in seeps, this is another of our gorgeous native wildflowers. Widespread, from Oregon to Baja, east to Utah, sealevel up to 7000', a mass of these in bloom is breathtaking. Fairly easy to grow in a home garden; they were available at the recent chapter plant sale. Mary Hunter sent this photo of Fetid Adders Tongue or Slink Pod (Scoliopus bigelovii), from Salal Creek on The Sea Ranch. The common name Fetid Adders Tongue comes from a faint bad (to humans) odor of the flowers, which attracts the fungus gnats that polinate it. Slink Pod refers to the heavy seed pod that bends to the ground on a slender stem, making seeds accessible to ants which aid in distribution. Ann Littlewood from Portland, OR, writes: Toward the end of April, I was fortunate enough to visit Annapolis Road south of Gualala. 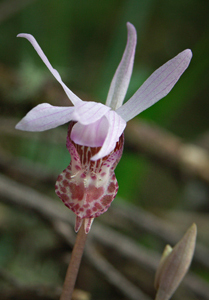 My sister and I had a wonderful stroll and saw Calypso bulbosa orchids, Scoliopus biglelovii, redwood oxalis, and the magnificent redwoods themselves. 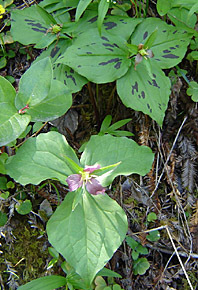 Our focus was Trillium ovatum maculosum and we saw many of them. We also visited Fish Road looking for T. o. maculosum and found none. 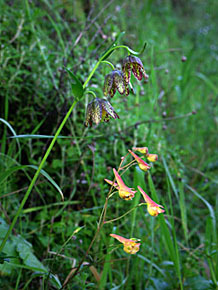 The photo was taken 4/28/08 and shows the usual form of T. ovatum next to the spotted form, T. o. maculosum. My understanding is that the spotted form is rare, found most abundantly on Annapolis road. My question is whether the population on this road has any protection or whether public ownership is underway. I believe, based on local signs, that this is a tree farm and therefore subject to harvest and destruction of the understory. Can you tell me the situation? From Bob Keller in Mendocino: "Yesterday (April 5) I drove down the coast to Alder Creek Beach and bluffs. It was a perfect balmy day and surprisingly I had the place all to myself. Although the displays were not solid carpets they were still very nice. 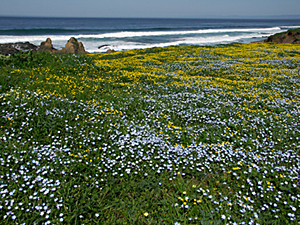 Expanses of Douglas Iris, cream cups, vivid poppies, paint brush, baby blue eyes, lupines and many others. 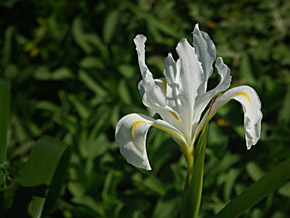 The unique small group of white Iris there on the blufftop only had one bloom and a couple of buds, but I'm sure more are on the way." Also from Bob Keller: "Along Highway 1 south of Elk I stopped at one of my favorite spots. This shot shows a very nice juxtaposition of mission bells (Fritillaria lanceolata) with canyon Delphinium (Delphinium nudicaule), which I was fortunate to spot. Also along this north-facing bank were crimson columbine, star false Solomon's seal, Saxifrage sp., fringe cups and others." 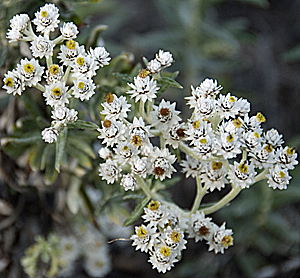 Bob Keller sent this picture, and asked, "I wonder if anyone can help with an identification of this scrappy little plant, halfway up Walker Ridge, west side of Bear Valley, Colusa County (Inner Coast Range). 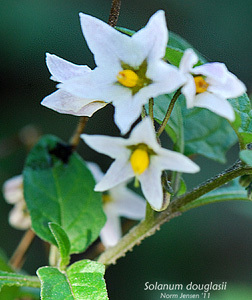 The flowers are about 5/8" across the front; they rise perhaps 4" above the ground. The leaves are somewhat thick and toothed, as can be seen in the photo." 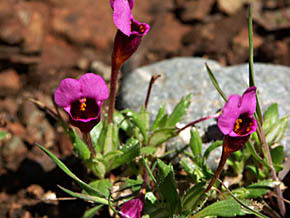 Reply from Norm Jensen: Yep, that's Mimulus douglasii, or purple mouse ears. Isn't it gorgeous? Here is one I got a shot of today, not far from my house. The poor thing had got snowed and rained on all yesterday, but is still hanging in. Scrappy is indeed the word for them! Bob Keller reports: "Made a foray March 30th over to Bear Valley in the inner Coast Range of Colusa County. The recent rains were great for the usually-dusty roads! There were impressive displays everywhere, mostly consisting of Gilia, cream cups, tidytips, goldfields, meadowfoam and others too numerous to list. Lots of lupine; some scattered nice Delphinium, too. The shooting stars are at the end of their bloom. Occasional owl's clover was looking good. Part way up into the serpentine of Walker Ridge were Iris and paint brush. Along the road at the north end I stopped to check out hillsides of wild hyacinth, blue dicks and others. But no adobe lily! I think I was too late." Bob Keller reports, "Yesterday afternoon (3/15) I paid my annual visit to my favorite Calypso patch in a dark Douglas-Fir woods off of Cameron Road. 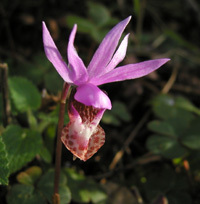 One typically sees at least 40-50 blooms coming up through the heavy forest litter/duff, and scattered among them perhaps 4-6 specimens of a very pale variety. These tend to be not as robust as the normally-colored flowers, and nod downwards giving the impression of not having fully matured or developed. They're more difficult to photograph because of the awkward angle. At any rate, here's a shot of one of them. The following image is the typical bloom in this area, altho' there is considerable variation in the expressions of the top petals." Nice scenic and detail photos from Bob Keller. "Yesterday morning (3/15) I ran up to the Glass Beach Bluffs to see what was happening. Wow! A beautiful display of carpets of wildflowers! And a perfect spring day to boot. So here's a general bluff shot and a second shot, which shows the three current principal components of the show together, Baby Blue Eyes, Cream Cups and our local subspecies of the Blennosperma. 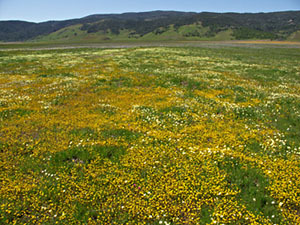 Aslo in evidence were the local paintbrush and a species of yellow-flowered wallflower. The poppies aren't happening yet, but they will! Their distinctive foliage was everywhere." Photo by Toni Rizzo, who says the specimen was "near Jughandle Creek about 4 miles inland. Late in the day, the sun formed a perfect spotlight on this lovely Trillium ovatum hiding deep in the forest." 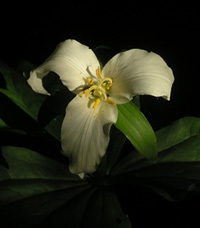 This trillium has several common names, including western trillium, wake-robin, pacific trillium, and western wakerobin. This also from Toni Rizzo. "Platystemon californicus. This pretty cream cup is reaching for the sun on a balmy Spring day." 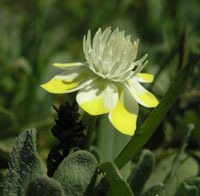 Hardy, adapted to a range of habitats, including oak woodlands, chaparrel, and grasslands, cream cups can be found in nearly all California counties. 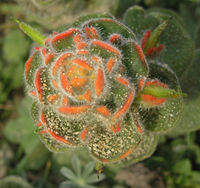 "Castilleja mendocinensis. I believe this paintbrush is found only in Mendocino County. The colors and texture are different than any other paintbrush species I've seen." CNPS calls Mendocino coast Indian painbrush very rare. Like all paintbrushes, it is a hemiparasite, meaning it gets some nourishment from a host, and some from photosynthesis. Photo by Toni Rizzo. Photo by Toni Rizzo, who says, "Platystemon californicus. 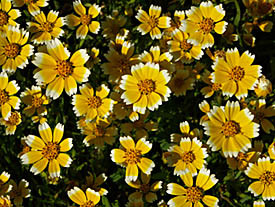 Also called cream cups, the delightful lemon and cream contrasts nicely with the surrounding green foliage." 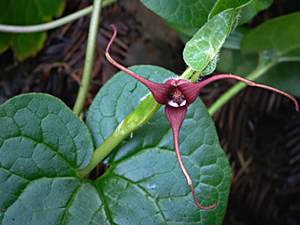 This shot of Long-tailed ginger, Asarum caudatum, was taken "two miles upstream from the Woodlands Camp. This patch of wild ginger was about 30 yards long in shady redwood/mixed forest - the flowers hide beneath the large, aromatic, heart-shaped leaves." Photo by Bob Keller. This photo was sent in by Bob Keller of Mendocino. 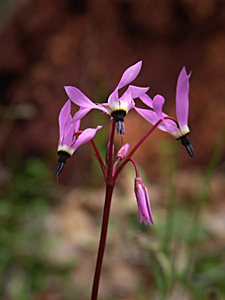 Henderson's shooting star, Dodecatheon hendersonii, can be found in dry meadows and open forest. Also called Broad-leaved shooting star, from the shape of its leaves. 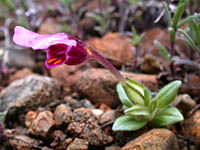 Another from Bob Keller, a nice group of Indian warrior, Pedicularis densiflora. This common species is related to the paintbrushes. Also from Bob Keller. 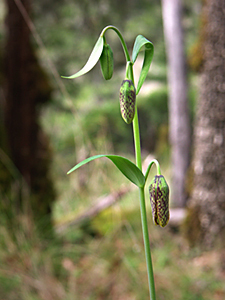 Fritillary buds. Anyone have an idea of the species? 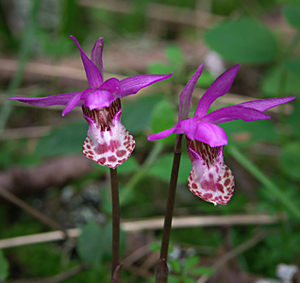 When you chance upon the Fairyslipper or Calypso Orchid, Calypso bulbosa, get down on your knees for a whiff of its wonderfully sweet scent! 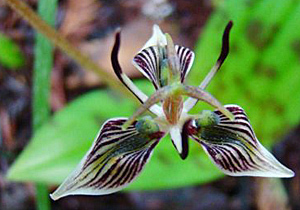 While you're there, notice the intricate structure of the flower, with delicate hairs on the lower lip, and the single oval leaf on the ground at the base of the stem. 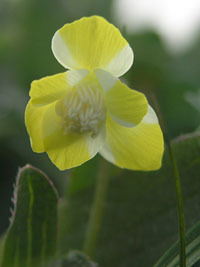 The leaf is produced in the fall, and remains as the flower develops, until the next summer. Photo by Bob Rutemoeller, from 2004. 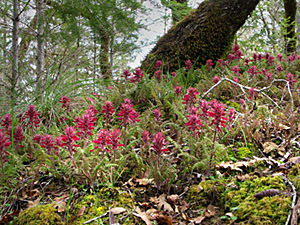 Spotted Coralroot, Corallorhiza maculata, a member of the Orchid family, is found in open shaded coniferous forest in decomposing leaf material. 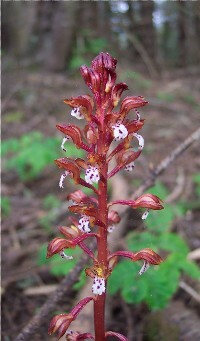 It and its close relative, western coralroot, Corallorhiza mertensiana, which lacks the reddish-purple spots on the lower lip, are widespread and common. Photo from 2004 contributed by Penny Lancaster. 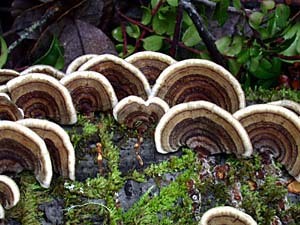 It's easy to see why this widespread fungus, Trametes versicolor, has the common name Turkey Tails! Photo taken by Norm Jensen.